Located on the southwestern shore of Auckland’s Waitemata Harbour, the affluent suburb of Herne Bay is filled with elegant homes that are anything but ordinary, and this new home is no exception. 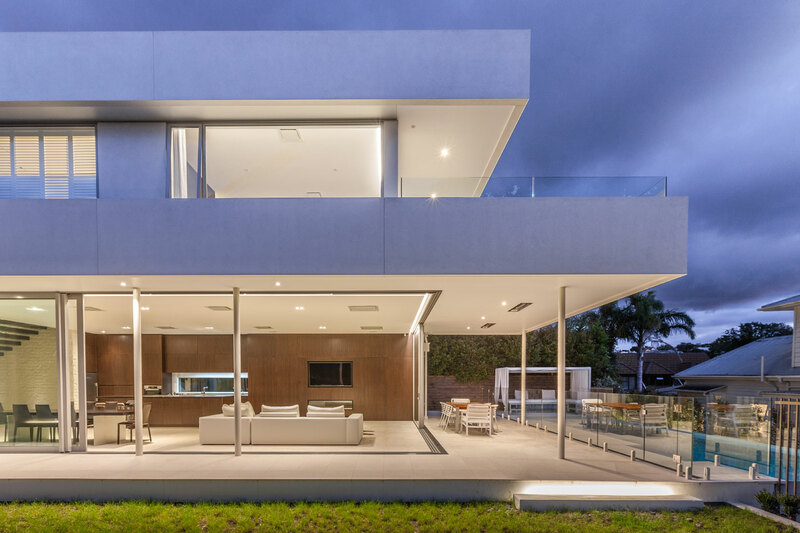 Specialising in high quality bespoke residential design, Jason Bailey and his team of architects were tasked with creating a ‘classic, modern aesthetic’ – the result is a crisply defined home that despite its minimal furnishings, restrained palette and clean lines, radiates minimalist comfort. Clever storage solutions and concealed spaces combine with rich textures and natural warmth to create a space that successfully balances the serenity of minimalism with all the comforts you would expect from a cosy traditionalist abode. We caught up with Jason to learn more about the project and how his team managed to get this combination just right. Hi Jason, Can you tell us about the brief for this project? 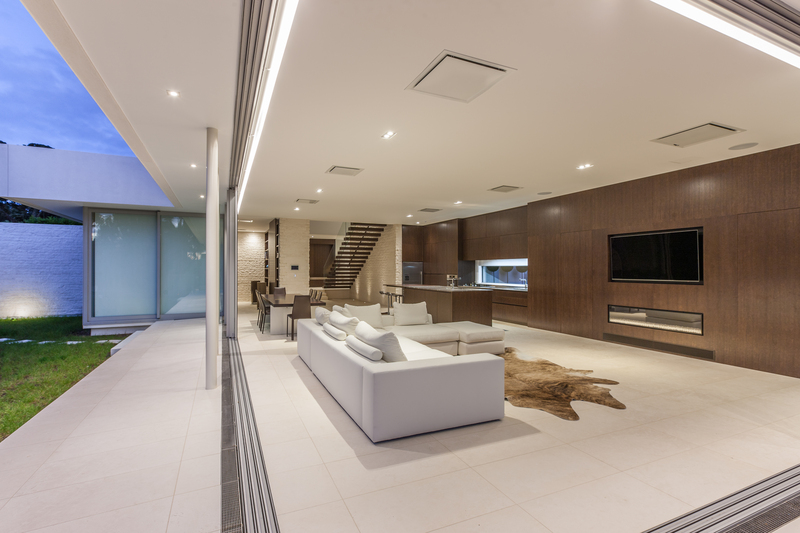 Our client desired a modernist home with a horizontal monolithic appearance. We put a lot of work into minimising the structure to create a seamless open flow between the house and garden. The materials used consist of a restrained palette dominated by pale limestone floors and rusticated walls, which is contrasted by the dark oak cabinetry and stair treads. How would you describe your design philosophy and did any of these make their way to this home’s design? We have not done another house quite like this. I think this primarily reflects our client’s clear vision from the outset, and his enthusiasm to involve us with every aspect of the design. All three of us on the Jason Bailey team for this project were on the same page too, and we collaborated intensively throughout the design and build project. I think this really helps the cohesive feel of the build result. The richness of the dark oak cabinetry and stair treads provides a stark contrast to the restrained palette of limestone floors and rusticated walls. What was your favourite thing about this project, and the most challenging? Our favourite part is the natural light resulting from the minimal palette – it imbues an immediate sense of calmness when you enter the house. We had some drainage challenges with this project – the house had to bridge a big public sewer drain, and the stormwater connection was set very high in the original subdivision. We do put a lot of energy into solving some very unglamorous problems. Any interesting or quirky facts you could share with us about the home? The fireplace wall in the living area conceals a working kitchen and a wine cellar, concealed behind hinged oak panels either side of the fire. A working kitchen and wine cellar are concealed behind hinged oak panels either side of the fireplace. Can you talk us through the fireplace and how this fits into the home’s design? 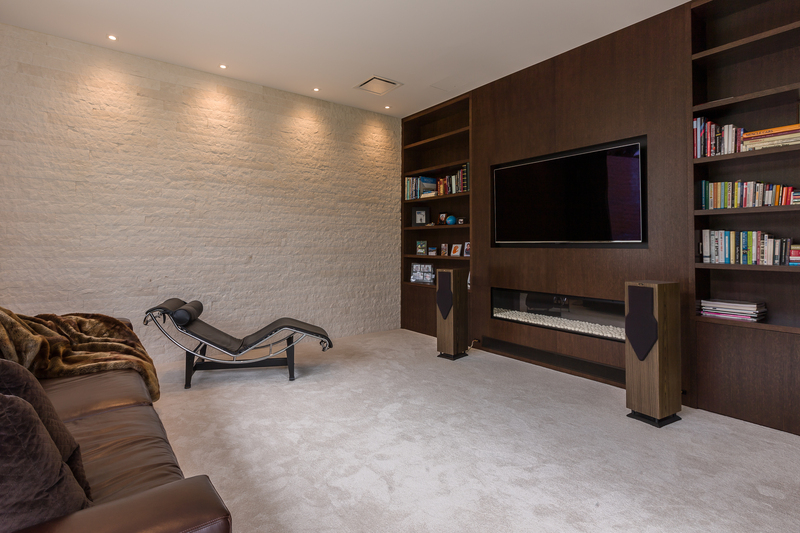 The clean horizontal form of the Escea DX1500 gas fireplace fitted very well with the aesthetic of this home. It has the scale to work in a big space and gas was an obvious choice for a sophisticated and low maintenance interior too. We specified the same fire in both living spaces, and the surrounding oak cabinetry is intended in both cases to be as minimal as possible, so that the fire simply reads as a ‘hole in the wall’. We chose the white pebble fuel bed as it ties in nicely with the limestone floors. 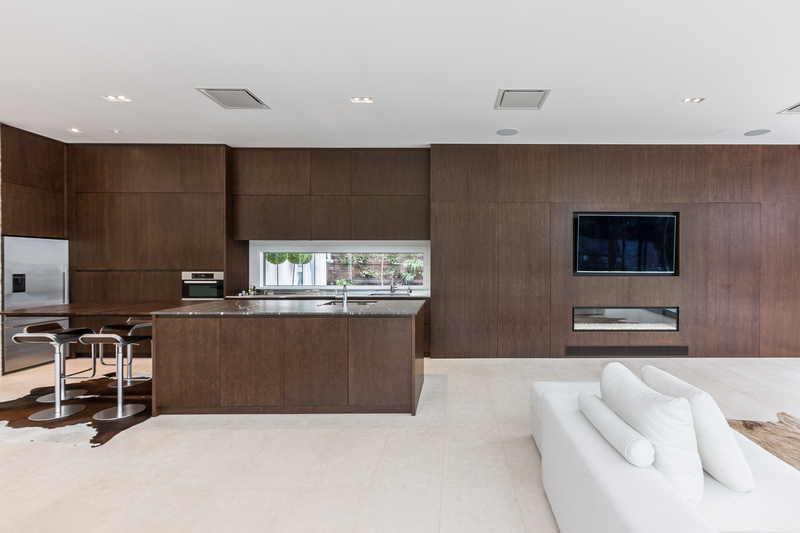 The DX1500 was specified in both living areas and surrounded in the same rich dark oak cabinetry. And lastly, what is your best piece of advice for someone designing and building a new home? Go overseas for six months during the initial construction period and let the builders get on with it, if you can. Come back for the latter stages, after the house is closed in, when the site is more interesting, and there are more interiors-related decisions to be made. It worked well in this case! To learn more about the DX1500, see here.